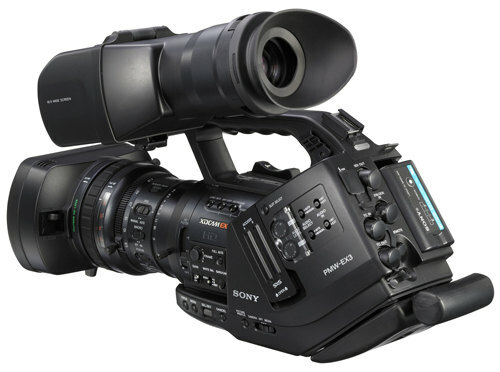 The Sony PMW-EX3 is a flash-memory based high definition camcorder capable of a variety of frame rates and resolutions using Sony's new XDCAM-EX intraframe codec. A "big-brother" to the PMW-EX1, the PMW-EX3 ups the ante by providing an interchangeable lens mount. The mount allows users to put a variety of professional lenses on the camera, including 1/2" and 2/3" bayonet-mounts. Enhancing both usability and workflow efficiency, the PMW-EX3 has an extensive set of features that push the boundaries of traditional handheld cameras, including a continuous record time of up to 140 minutes! Whether shooting in 720p, 1080i, or 1080p modes, the PMW-EX3 has it all covered. Its bevy of output settings lets users take advantage of fast and slow motion, as well as popular framerates such as the "film-like" 24p mode. The supplied lens is a Fujinon HD 14X 5.8-81.2 f/1.9. The Manfrotto 521EX Sony PMW EX1 Remote Control is designed specifically for the Sony EX series video cameras. The Sony PXU-MS240 Mobile Storage Unit is a portable and lightweight recording device which makes it easy to transfer and store footage recorded on SxS cards. By using proprietary mobile drives, the PXU-MS240 can transfer XDCAM EX footage and extremely high rates, making it ideal for field archiving. With the ability to store up to 11 hours of footage on one drive, the unit is versatile enough for shooting documentaries, indie films and weddings. With the ability to connect to a PC or Mac via both eSATA and USB 2.0, the drive is both fast and flexible, no matter what your workstation requires. The Anton Bauer QR-EX3 is a mount for the Sony PMW-EX3 XDCAM EX camera. The mount attaches to the rear of the camera and holds both Dionic 90 and HyTron 50 Anton Bauer batteries. The battery pack not only provides additional power to the camera, but also acts as a counter-balance, making the camera easier to mount on one's shoulder. The 77mm T1 Infrared Filter from Tiffen is a high-tech filter targeted towards eliminating infrared contamination at 680nm. This filter will assist you in maintaining your color spectrum when shooting against a dark fabric. You will notice the blacks turn out true with no color cast from the red end of the spectrum. This filter has been created to help capture a much broader spectrum of color than previous infrared filters - particularly with digital camcorders. Color shift is a critical factor in digital photography especially when dealing with the infrared spectrum - and even more important when shooting with HD technology. Unlike traditional film cameras, CCD or CMOS sensors of a digital camera are, by nature, susceptible to infrared contamination. Manufacturers try to avoid this problem by incorporating an infrared absorbing filter on top of the image sensor. Because these filters do not have a sharp cutoff at the infrared wavelengths there has to be a compromise in order not to exclude visible red wavelengths. Despite these precautions, some infrared wavelengths pass through resulting in contamination of the image. One 8GB card is included with an XDCAM camera rental. WARNING!!! This card will not function in Sony EX1 cameras unless the software has been upgraded with new version 1.11 firmware from Sony (this normally requires shipment of camera to Sony).